New York University students heckled and disrupted an appearance by Henry Kissinger on Tuesday, accusing the former US Secretary of State of complicity in war crimes and crimes against humanity. Meanwhile, protesters – some of them members of the International Socialist Organization – gathered outside to denounce Kissinger’s checkered history of bloody foreign policy positions, including his support for Chilean dictator Augusto Pinochet in the 1970s, under whom some 80,000 political opponents were jailed and at least 3,000 executed. “Henry Kissinger, on behalf of the International Criminal Court, you are a war criminal, you have committed genocide against the people of the world!” before being escorted out by security. Like the first interruptor, the second was removed, as the crowd’s boos and jeers became louder. The same thing happened when a third protester spoke up. Heckling and chanting continued as Kissinger departed the event later that evening. 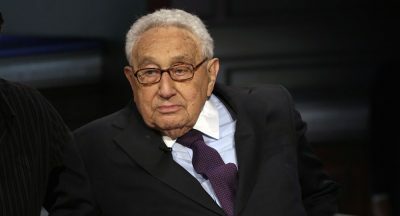 Throughout Kissinger’s long diplomatic career, he was lauded for easing US relations with the Soviet Union and China, as well as negotiating the end of the Vietnam War. However, he has also been criticized for orchestrating a US-sponsored coup in Chile, giving the Argentinian junta free rein to commit mass murder and human rights abuses after the 1976 coup, and supporting Pakistan’s genocide against Bangladesh in 1971. Kissinger also oversaw the escalation of the Vietnam War into Laos and Cambodia, which devolved into a four-year bombing campaign that killed as many as 100,000 civilians. Worse, it cleared the way for Pol Pot’s Khmer Rouge to take power in Cambodia’s ensuing power vacuum, and commit genocide of an estimated 1.5 million people.